Welcome to Monkey Monday which from now on will be a fairly regular update of what is going on in the world of Monkey. Furture Monkey Mondays will feature reports from my home Sunday playtests as well as bits about the ongoing development of Monkey the 2nd Incarnation. This week I give the joyous news that Peter Frain has completed the first assignment of new art for the game. I asked Peter to do individual pieces of the four main characters form the Book/TV Series. This he has done to an outstanding job, surpassing even his high standards. 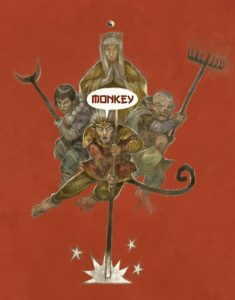 Four black and white line pieces of each character and a group shot of Monkey, Sandy, Pigsy and Tripitaka have been complted, and out of the group shot Peter pulled this individual illustration of Monkey which I asked him to colour. Gowan click on the croutching Monkey and you’ll see him magically grow in size! This is the convention game I ran at Furnace last month. It ran to a group of four players, playing the Pilgrims (Monkey, Sandy, Pigsy and Tripitaka) on a Saturday night, where to be honest after a day of hyperactive GMing and a social with Hobgoblin Beer on tap the night before I was a bit worse for wear. But I need not have worried. 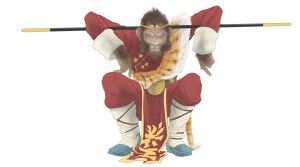 The Monkey is designed to give the players lots of freedom to play the game they want, while emulating the source material, without the GM being heavy handed, and the player’s got into the swing of things and carried the game with much gusto. 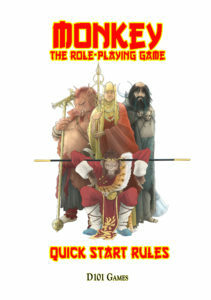 I introduced the new tweaked rules for 2nd Incarnation, and a new way of dealing with large groups of opponents naturally arrose from the game. So much fun was had by all. 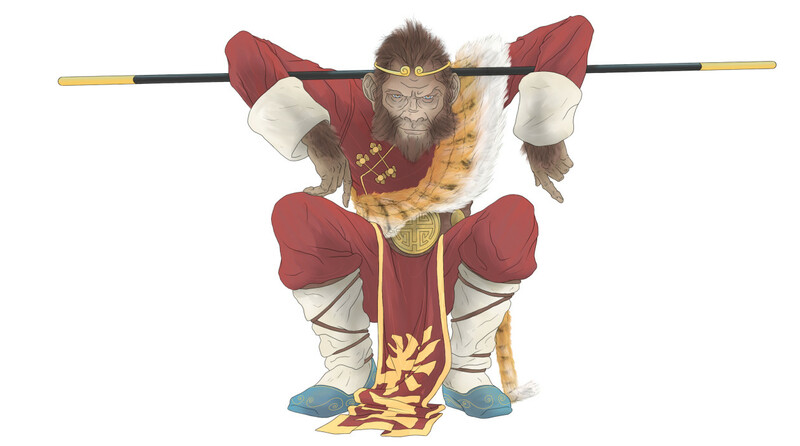 I’ll do a more indepth write up of the game for a future Monkey Monday.